Commercial templates using guide bushes are available for letters, numbers, holes for cable tidying, letterbox apertures, inlaying, etc. 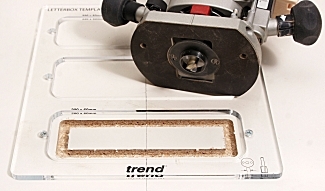 Templates made of 5mm thick clear plastic are available from Trend, for use with any plunge router fitted with a 13mm guide bush and an 8mm (5/16) straight cutter such as the T208M, T1108M & T1408M, depending on shank diameter. Letters and numbers are cut at a depth of 2-3mm. 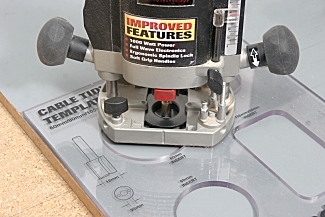 A medium-duty router such as the T5 is adequate for the job and the guide bush offered by Trend for the template is one of their plastic ones with a shorter than usual spigot. The letters are uppercase only and all letters and numbers are nominally 57mm high. 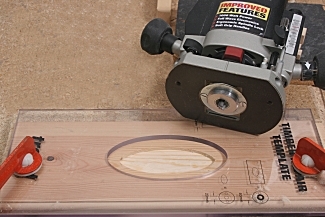 A thin batten clamped to the workpiece enables the router base to be run against it, ensuring that all characters are at the same height from the baseline. An 8mm thick clear plastic template with three circular holes and one rectangular one enables various size apertures to be cut in desks, tables, doors, panels etc. for running computer, telephone and audio cables through. An additional hole in the template enables blind holes for 35mm kitchen cabinet hinges to be cut. The template is used with a 30mm guide bush and a 12mm diameter straight cutter. A medium duty router is suitable for most applications. The cable holes are intended to be used with plastic inserts, available from Trend, which give a neat appearance and have spring-loaded covers that allow plugs to pass through. The template has an additional use, which comes in handy occasionally. By varying the diameters of guide bush and cutter you vary the offset, so you can vary the size of holes cut using the apertures in the template. You sometimes need to cut holes of dimensions that are not critical to a millimetre or two. This is a way of doing it. Trend offer two alternative methods for cutting letterbox apertures: a substantial adjustable metal jig, and a clear plastic template TEMP/LB/A with provision for three different size of aperture in doors of up to 50mm thick. The template is of 6mm thick plastic requiring a 1/2in router for heavy doors, a 30mm guide bush and a 12mm diameter straight cutter. The three plate sizes catered for are the three most popular sizes: 220 x 50mm, 210 x 60mm, and 200 x 60mm. The template being only 6mm thick, you will need to check the projection of your 30mm guide bush. The door is placed, outside face down, on two trestles or other suitable support. Any breakout as the cutter breaks through will be hidden by the letter plate surround. The template is secured with two screws, the holes for which will, again, be hidden by the letter plate when fitted. 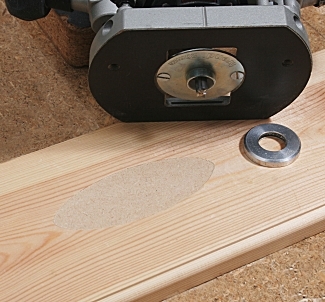 With the 30mm guide bush and 12mm cutter fitted to the router, the cut is made in a clockwise direction around the template with a series of light cuts of 6 – 8mm depth. This is a ‘fail-safe’ cut in that if you let the router come away from the edge of the template you are cutting into the waste. This is a rather large basic example of inlaying. It is intended for taking out knots and resin pockets in timber, particularly in softwood. A good example is removing a knot in an exposed floorboard. 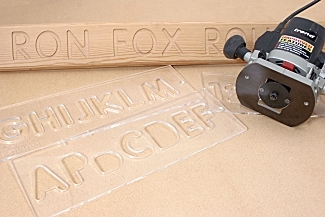 The template consists of 8mm thick clear plastic with an oval shape cut in it. It is used with a medium-duty router, a 1/4in shank 10mm straight cutter and a 20mm guide bush with a 40mm collar. With the template positioned over the blemish, fit the 10mm cutter and the 20mm guide bush complete with 40mm collar. Set the cutter depth to the thickness of the repair piece. If this is more that about 6mm, make the cut in more than one pass. With the 40mm collar located against the inside of the oval, make the cut in a clockwise direction. When the perimeter cut is completed, rout out the centre of the oval to give a flat-bottomed recess. To cut the repair patch, position the template on the repair material, remove the 40mm collar from the guide bush, and make the cut, again in a clockwise direction. Be careful to keep the guide bush pressed against the edge of the template: if you come away from it you are cutting into the repair patch, not the waste. If, for the patch, you use the same type of timber as you are repairing, and if you align the template with the grain, the resulting repair is almost invisible. I used contrasting materials to show up in the photograph. If you study Pics 21 & 22 you will see why the collar is necessary. The size of the recess is determined by the outside edge of the cutter, while the size of the repair patch is determined by the inside edge. If we used exactly the same set-up for both cuts the repair patch, being made with the inside edge of the cutter would be 10mm smaller all round i.e. smaller by the width of the cutter. Try it on scrap material and see for yourself. We can confirm the validity of this by calculating the offsets for the guide bush, with and without the collar. Without the collar (20 – 10) ÷ 2 = 5mm. With the collar (40 – 10) ÷ 2 = 15mm. 15 – 5mm = 10mm, which is the diameter of the cutter. This is the ‘inlay problem’. You have to make sure that the shape fits the recess. If you consider this for a moment you will see that any combination of guide bushes and cutter will work provided that the diameter of the cutter is equal to the difference between the two offsets given by that cutter and the two guide bushes. 1.The two guides bushes and the cutter are of exact size. A worn cutter will give a smaller recess and a larger patch. 2.The guide bushes and cutter are not of exact size, but a compensating error gives a perfect fit. I wouldn’t rely on condition 2. The repair patch was a simple example of an inlay. You might want to set much more interesting inlays in, say, the lid of a box. You can buy rosettes and other ready-made marquetry inlays for such purposes, or you can buy various shaped templates e.g. stars, hearts, animals, etc. to set in projects such as toy boxes, blanket chests, and children’s furniture. The inlay kit usually supplied for these smaller, more complicated shapes consists of a 1/8in diameter downcut spiral with a 5/16in diameter guide bush plus 9/16in diameter collar. The difference in the two offsets is 1/8in, which is the diameter of the cutter. The kit shown in Pic 6 is a CMT US-style guide bush and collar, plus a 1/8in downcut spiral solid carbide cutter. Trend supply a similar kit, and also offer a range of plastic shapes for inlaying. Note: For perfectly fitting inlays you wouldn’t want to mix imperial and metric diameter bushes, collars and cutters. The jigs and templates described above by no means exhaust the range available, but they illustrate the scope of commercial guide bush applications, and emphasize the benefits of choosing a router that can take a wide range of bushes.